How many of us can admit to immediately waking up in the morning and reaching for our phones? The answer is probably the majority of us. So is this considered an addiction? We, as humans, rely heavily on technology to go about our daily routines. There is no official mental disorder classified as “technology addiction” but this term can encompass addictive behavior related to social media, excessive texting, information overload, online shopping, gambling, video gaming, and overall smartphone usage. IF ADDICTED TO TECHNOLOGY, WHAT DO YOU EXPERIENCE? INTERNET GAMING DISORDER-WHAT IS IT? This is the term for an addiction to video games. There are both functional and structural changes in the neural reward system, so essentially these changes are the same as one would see in a person with an addiction. Video gaming is a relatively new field of study, so research on addiction to gaming is still in its infancy. WHAT ARE THE EFFECTS OF VIDEO GAMING? Positive aspects: attention, visual, and motor skills are improved. Negative aspects: risk of addiction, which can cause any of the symptoms listed above. Because this is such a new field of study, it is not known yet what aspects of games affect brain regions and how. You use technology as a way of escaping problems or relieving negative feelings (such as helplessness, guilt, depression or anxiety). You constantly check your smartphone, even if it does not ring. You get paranoid when your phone (or any other device) is not with you. You ignore what is happening around you, in real time, in favor of what is happening virtually. * (2017, Spring). 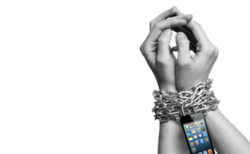 Addicted to Technology? Binghamton University Magazine. * Palaus, M., Marron, E. M., Viejo-Sobera, R., Redolar-Ripoll, D. (2017). Neural Basis of Video Gaming: A Systematic Review. Frontiers in Human Neuroscience. Retrieved from http://neurosciencenews.com/video-games-brain-6963/>. * “We live in a society inebriated by technology.” Brutally Honest. Image version: 6a00d8345169e201a3fd1c1af4970b. Image found on http://www.brutallyhonest.org/.a/6a00d834516bb169e201a3fd1c1af4970b-250wi.